Calling all the students out there! 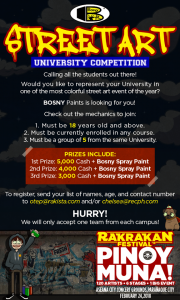 Would you like to represent your University in one of the most colorful street art event of the year? Bosny Paints is looking for you! 1. Must be 18 years old and above. 2. Must be currently enrolled in any course. 3. Must be a group of 5 from the same University. Hurry! We will only accept one team from each campus!